Weishan on a mid-summer’s afternoon is a sleepy place where nothing much happens. 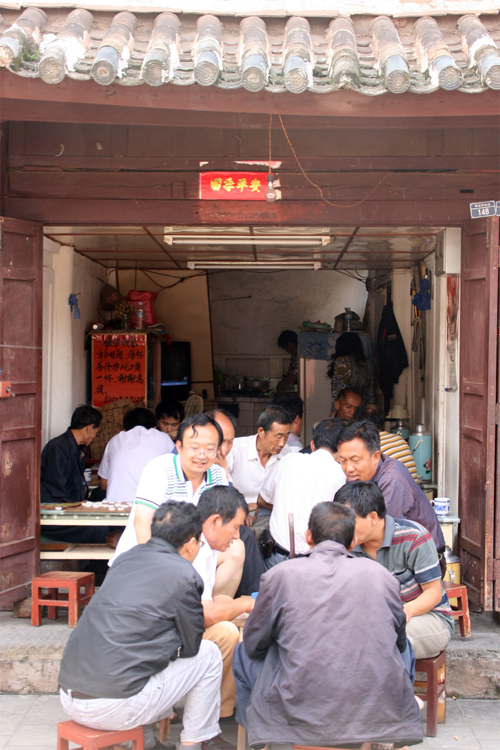 This is small town China, where pipe smoking, card playing men squat on small bamboo stools that spill out onto the pavement and street, and while away their days in the teahouses. 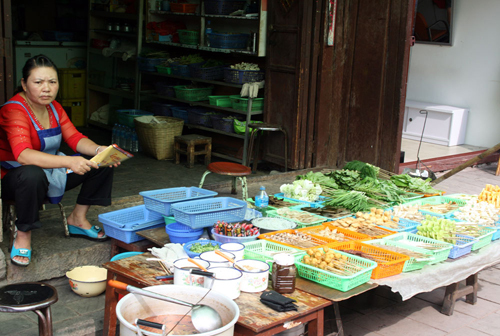 Women sit by the roadside, grilling vegetables, or tend to their small shops. 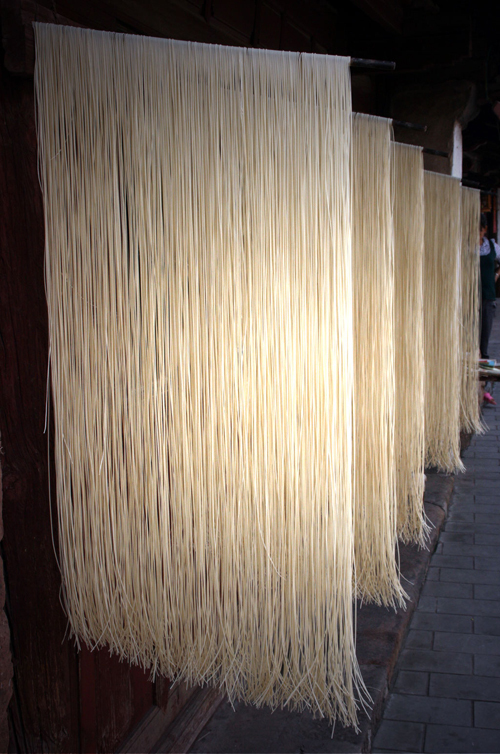 Long strings of drying noodles sway in the gentle breeze and baskets of freshly picked boletus, neatly arranged in wicker baskets, wait for buyers. 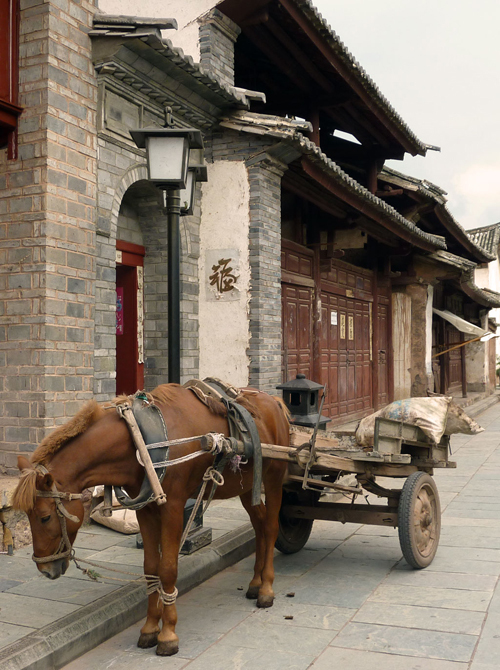 Local transport is equally divided between the motorized and the equine, with trishaws and horse carts vying for right of way in the narrow streets. 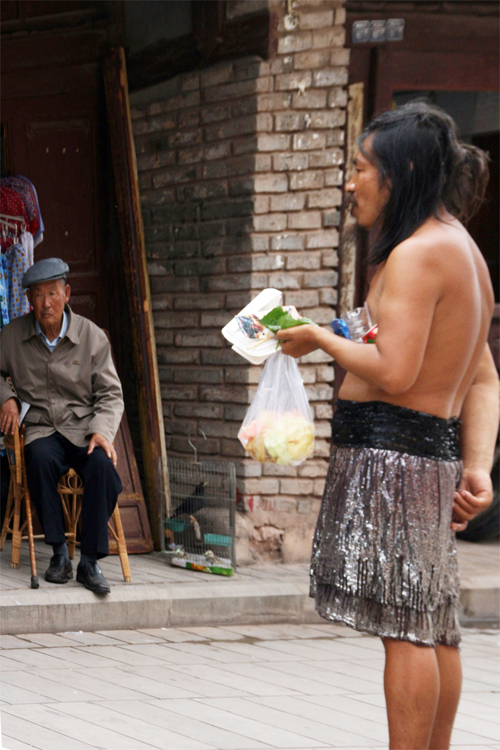 The peace is only broken by the antics of the local madman who runs up and down the street, naked apart from something resembling a Polynesian skirt, and provides the principal entertainment of the day. 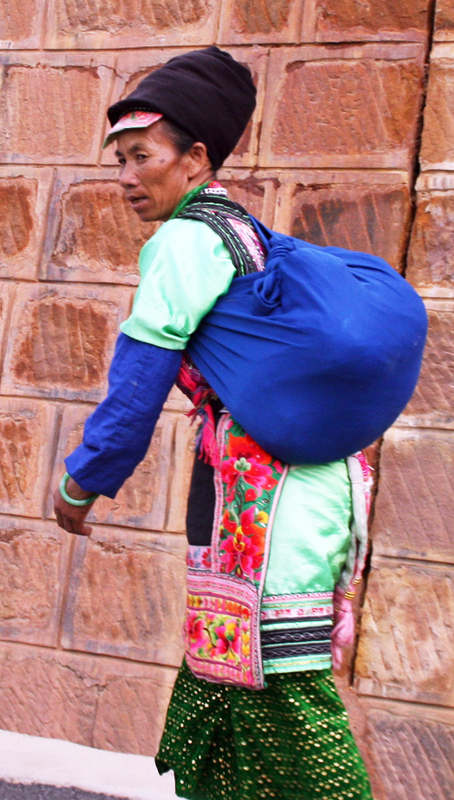 Weishan is situated in a fertile valley in the heartland of Yunnan’s Yi minority, about 60 kilometers from Dali. 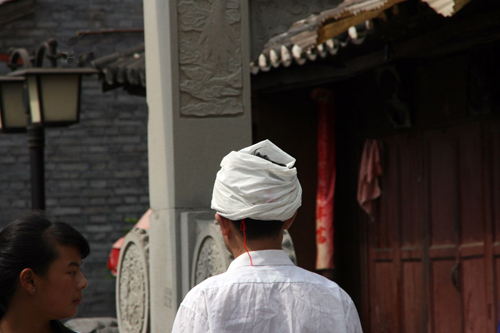 You’ll see the Yi, many still dressed in their traditional clothes, coming in to Weishan for the market and for their shopping. 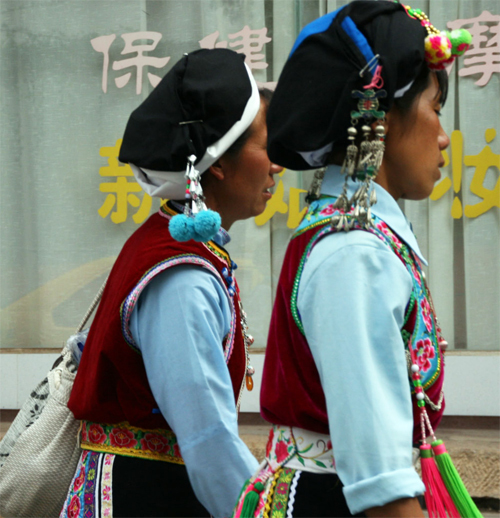 The Yi ladies in the Weishan area wear colorful clothes, with flowery belts and aprons, and large cloth caps with dangling pompons and huge silver ornaments. 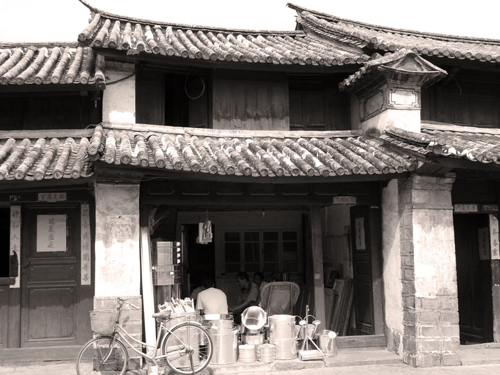 The majority of the local population may be Yi, but the buildings are certainly more reminiscent of the Bai minority architecture, such as you can find in the beautiful villages around Erhai Lake, in towns like Xizhou. 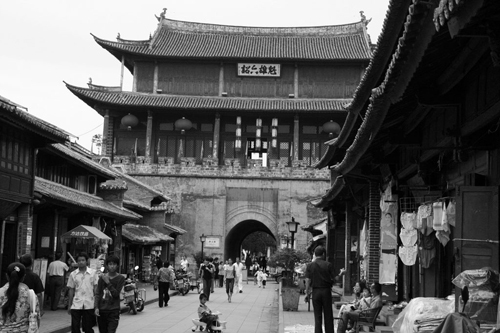 The imposing gate tower is the town’s architectural highlight. 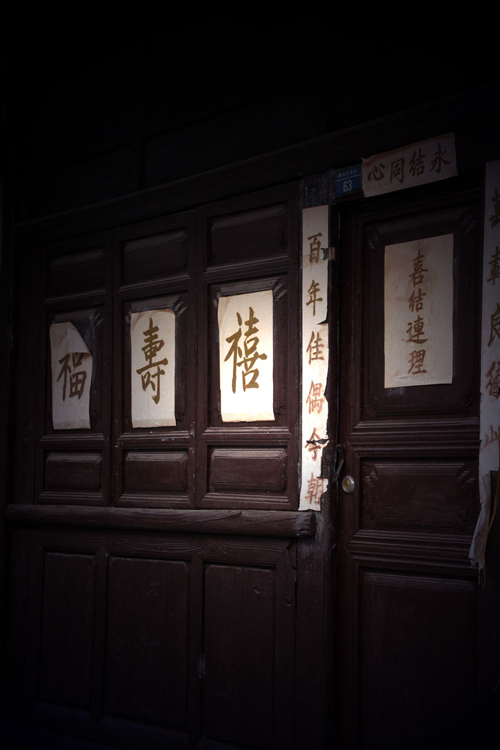 Then there are a couple of large mansions, some of which have been done up to serve as museums or traditional inns, but really Weishan is all about strolling and soaking up the ambience of rural China. 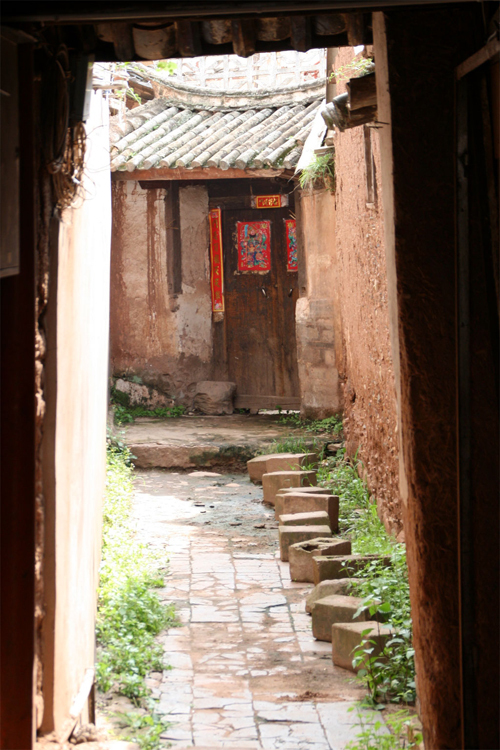 Weishan has quite a special feel, thanks to its beautiful and enchantingly authentic old quarter. Restoration has been subtle and quite tasteful, without altering the old China ambience of the town, leaving what I’d call a fine balance. More importantly, it is still a real working town, the shops, bar one or two, are there to serve the local population and not tourists. 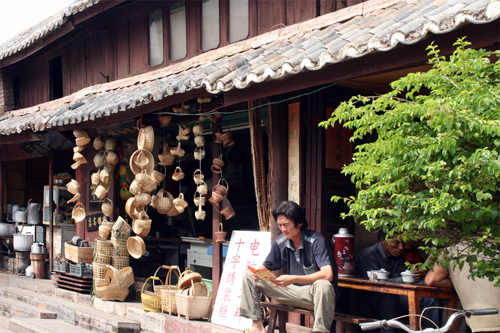 There are some stores making wicker baskets, others selling Yi clothing, several funeral parlors, a couple of teahouses and the odd trendy hairdresser; all of them installed in the vernacular architecture of the region characterized by its wooden facades, ornate gates and doorways, exquisitely painted walls and tiled, eaved roofs. There are plenty of places to have a snack, or a simple meal. Close to the city wall and gate tower, there is even a fairly trendy bar with a great terrace for people watching. 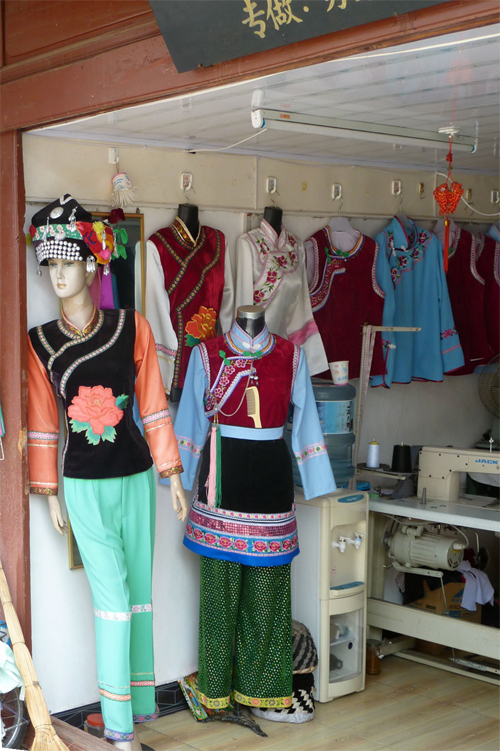 You can observe the shopping Yi ladies, dressed in their traditional costumes, mixing with fashionable local teenagers in skinny jeans and leather jackets and get a good feel of the general atmosphere of the place. Having spent a lovely afternoon pottering around the old streets, we found it very hard to tear ourselves away and we really wished we could have spent the night there. 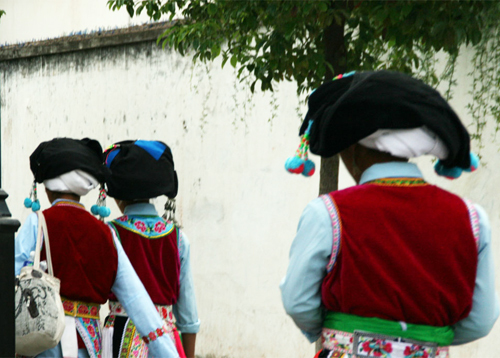 There are plenty of buses from Xiaguan’s (Dali City) West Bus Station to Weishan throughout the day. They can do the 60 odd kilometer trip in little over an hour along the new motorway. As we had only a day, we hired a taxi for 500 Yuan; an excursion that also included stopping for several hours at the nearby Taoist mountain of Weibao Shan 巍宝山. 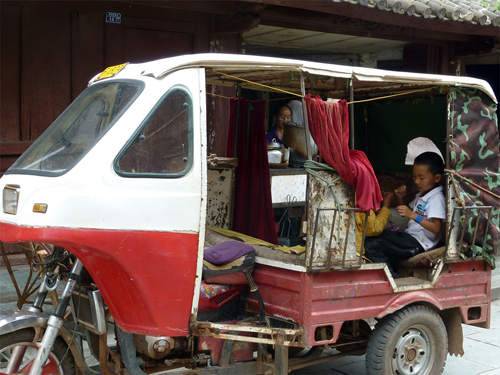 If you want to visit Weibao Shan from Weishan (12 Kilometers), you’ll have to get a taxi (80 to 100 Yuan including waiting time), as there didn’t seem to be any public transport. There were a few restored mansions in the old quarter that had been turned into traditional Inns. 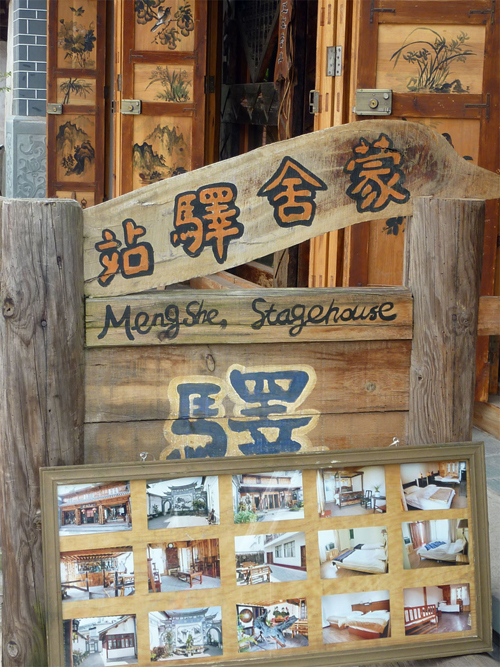 In the Mengshe Stagehouse (蒙舍驿站) nice looking rooms went for around 120 Yuan. 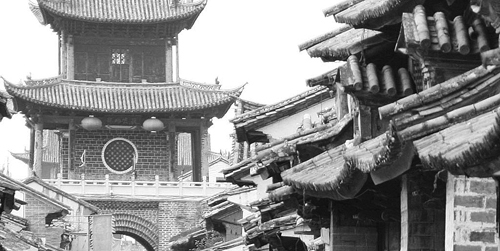 Outside the old town, there is your usual choice of Chinese 3- star, white- tiled hotels. Snacks are everywhere in the old and new town. However, one restaurant caught our attention. Just as we were leaving, we popped into a lovely old courtyard house that was absolutely heaving with locals and buzzing with waiters carrying huge platters of food. The smells wafting from the dishes were amazing. I’m afraid we didn’t take down its name. The restaurant was close to the gate tower, in a side street off to the left of the historic street (when walking with your back to the gate tower). 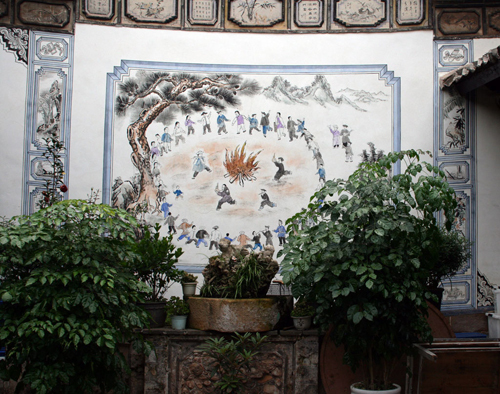 You’ll know you’ve found it when you see the famous Yi painting on the wall of the entrance courtyard. 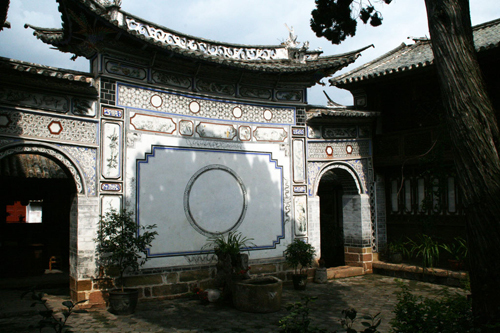 The original is in Weibaoshan’s Wenchan Palace. If anyone knows the restaurant’s name, please let me know. 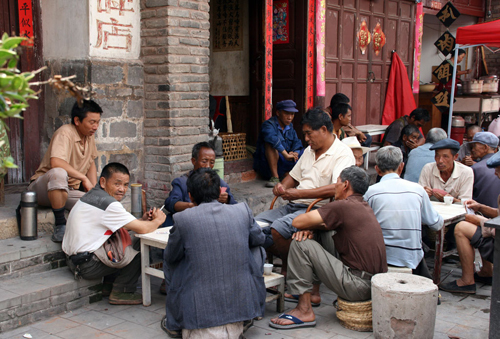 Reminds me of the villages I visited an hour outside of Kunming. It was market day and was so amazing. I’ll never forget that visit. I hired a taxi and he took me out there.